WE like to complain in the Alzheimer's community that no one helps us. Is their HOPE? This is our time and it is up to each and everyone of us to take action - NOW. The HOPE for Alzheimer's Act will ensure newly diagnosed Medicare beneficiaries and their caregivers receive comprehensive care planning services and will require their diagnosis to be documented in their medical record. Although Medicare already provides coverage of Alzheimer's disease diagnostic services, it currently does not provide coverage for comprehensive care planning following a diagnosis. The Act, if passed, will also help inform health care providers about what steps should be taken following a diagnosis, which will enhance assistance for people with Alzheimer's and their caregivers. 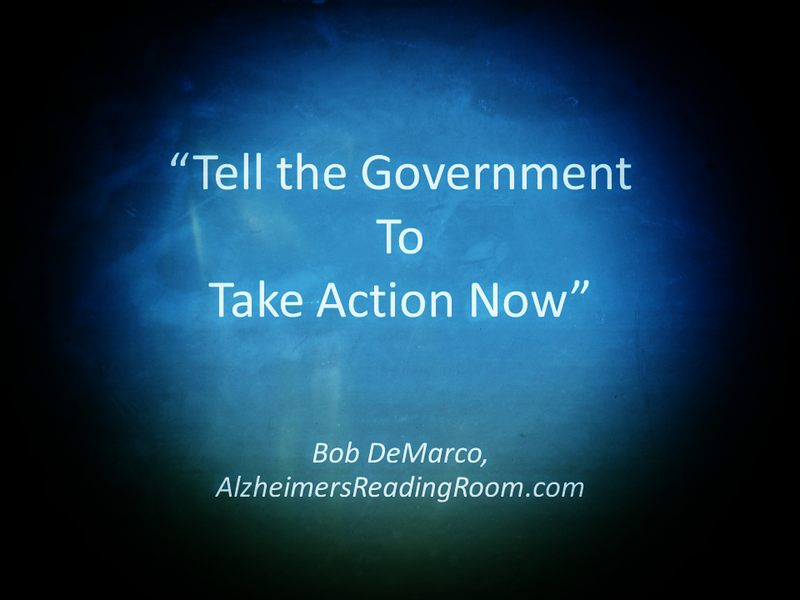 Pick up the phone and call your elected United States Senator or member of the House of Representatives and tell them you want their support for the HOPE for Alzheimer's Act (S. 857 / H.R. 1559). Don't write, don't email, pick up the phone. When you call ask for the "constituent liaison". This is the person responsible for talking to constituents (voters). Use the links below to find the phone number. It is time for us to stop complaining that the government is ignoring us. This is our time, and this is our chance, to let them know how we, the voters, feel on issues like this one. It is pretty simple. Either you are part of the problem, or part of the solution. Please take action right now - pick up the phone. Please share this in Alzheimer's support groups, and via social media (Google +, Facebook, Twitter, etc). Get everyone you know to call. I can only pray that the more than 5 million families that are currently living with Alzheimer's will pick up the phone and make a difference. Will you and the members of your family do it? "Current coverage for care planning falls short of what is necessary for people newly diagnosed with Alzheimer's and their families to adequately process and plan for their new reality," said Robert Egge, Alzheimer's Association chief public policy officer. "This legislation encourages doctors to talk to their patients about an Alzheimer's diagnosis and ensures that the necessary steps are taken to provide them with access to available care planning services." This is a direct appeal to every member of the Alzheimer's Community. The Alzheimer's Association strongly supports the bipartisan Health Outcomes, Planning, and Education (HOPE) for Alzheimer's Act (H.R. 1559/S. 857), which was reintroduced in Congress today by Sens. Debbie Stabenow (D-Mich.) and Susan Collins (R-Maine) and Reps. Chris Smith (R-N.J.-4) and Paul Tonko (D-N.Y.-20). The HOPE for Alzheimer's Act will ensure newly diagnosed Medicare beneficiaries and their caregivers receive comprehensive care planning services and will require their diagnosis to be documented in their medical record. It will also help inform health care providers about what steps should be taken following a diagnosis, which will enhance assistance for people with Alzheimer's and their caregivers. According to the Alzheimer's Association 2015 Alzheimer's Disease Facts and Figures report, only 45 percent of people with Alzheimer's disease or their caregivers say they were told the diagnosis by their doctor. In contrast, more than 90 percent of people with the four most common cancers (breast, colorectal, lung and prostate) say they were told the diagnosis. Despite lack of a treatment to stop or slow the progression of the disease, studies have shown that there are benefits to early detection and diagnosis, including the ability for the person with the disease to participate in planning for the future, take advantage of available support services and participate in clinical trials if interested. "The early symptoms of Alzheimer's disease can be terrifying for individuals and their families, especially when they don't know what's happening and don't have a diagnosis," said Sen. Stabenow. "The HOPE for Alzheimer's Act will give Alzheimer's patients and their families the information and support they need to cope with this heartbreaking disease. Because of the work being done by advocates like David Hyde Pierce and the Alzheimer's Association, this can be the year we have a real breakthrough in the fight against Alzheimer's." "Under Sen. Stabenow and the other leaders of this bill, HOPE for Alzheimer's will help ensure that the millions of families nationwide facing Alzheimer's disease receive critical care planning services, making a devastating diagnosis slightly more manageable," said David Hyde Pierce, actor and Alzheimer's Association honorary board member. "Upon receiving an Alzheimer's diagnosis, patients and their families are frequently at a loss for how to effectively plan for the next stage of their lives," said Rep. Smith, co-chairman of the Alzheimer's congressional caucus, the Bipartisan, Bicameral Task Force on Alzheimer's Disease. "While Medicare currently covers a diagnostic evaluation for beneficiaries, the program then offers little support in terms of next steps. I believe it is vital that patients and caregivers have an individualized plan to cope, information on available resources and a path forward. When they know of the challenges awaiting them and the resources available to help them, individuals and their caregivers can more effectively manage treatment of the disease." The HOPE for Alzheimer's Act builds upon existing Medicare coverage of a diagnosis and incorporates recommendations made by the Advisory Council on Alzheimer's Disease Research, Care, and Services. Originally introduced in 2010, the bill has been modified to take into account a number of developments since it was introduced, including the passage of the National Alzheimer's Project Act (NAPA) and the Affordable Care Act (ACA).